We’ve found over the years that the level of luxury in India often astounds people. Even experienced, discerning travelers are regularly blown away by the elegance of the accommodations, the quality of the service and the remarkable five-star experiences to be had here. And if you’re looking for a luxury tour to India or the subcontinent, there is no better company to work with than Geringer Global Travel. 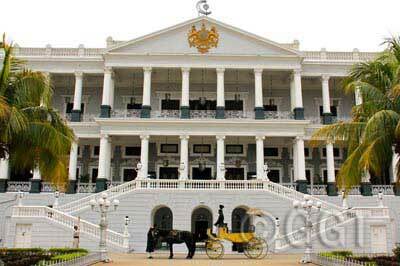 Taj Falaknuma Palace in Hyderabad (photo by Geringer Global Travel, India tour operator). We work with only the finest properties on our luxury tours of India, from such esteemed brands as Taj, Oberoi, Leela and CGH. The hotels are unlike any you’ll find anywhere else in the world—and many of them are listed regularly in Travel+Leisure’s “World’s Best” rankings. On an India luxury tour with Geringer Global Travel, you can expect an experience worthy of a maharaja—in fact, some of the hotels here were once the homes of Indian royalty. Stay in lavish rooms with exquisite appointments. Savor succulent dishes prepared by award-winning chefs. Immerse yourself in your private plunge pool or Jacuzzi, and enjoy the superior level of service you can only get from having your own personal butler. Every detail of your experience has been pored over to ensure it is uncommonly luxurious and truly unforgettable. The luxury comes not only from the regal refinements you’ll find all around you—terraced lawns, ornate fountains, reflection pools, perfectly manicured gardens—but from the experiences you’ll have. Arrive at your hotel in a horse-drawn carriage. Sip a cool cocktail poolside while looking out at the best view of the Taj Mahal anywhere. Indulge yourself in a relaxing, deep-tissue massage at one of finest spas in the world, or take to the links for some world-class golf. Prepare yourself for a surpassingly indulgent experience on an India luxury tour with Geringer Global Travel.